Pride Toronto is a non-for-profit organization with a mission to bring people together to celebrate the history, courage and diversity of the LGBTQ25+ community. Uniting and empowering people with divers sexual orientations, gender identities and gender expressions, the annual Pride Toronto festival has become a major Canadian arts and cultural event and the largest Pride celebration in North America. Pride showcases Toronto on the world stage with diversity, inclusion and vibrant creativity. 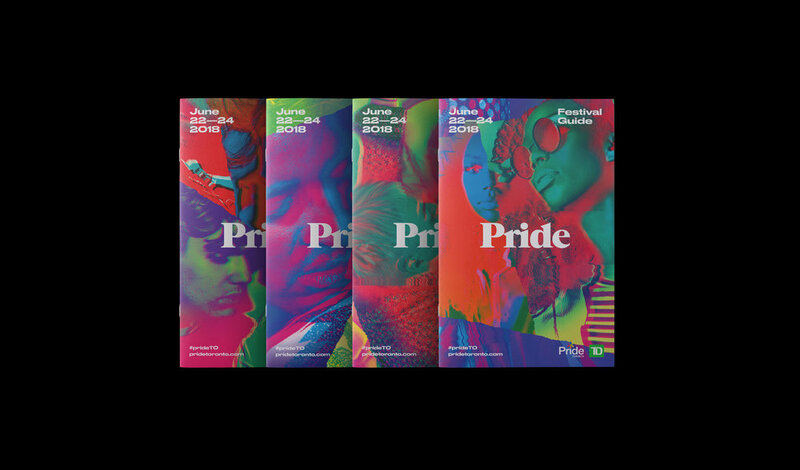 For the 2018 Pride Toronto Festival, Bruce Mau Design was tasked with creating a visual identity system that evolved beyond from the slogan-driven approach of previous years. At its core, the 2018 Festival aimed to celebrate 35 years of AIDS Activism and to honour both the communities and organizations who battle the surrounding stigmas. As part of our process, BMD dug into the Canadian Lesbian and Gay Archives for both inspiration and photography from decade’s past. The system pairs archival imagery with newer photography and features jagged rips and colours as bright as the community it represents. The identity is visually rooted in the history of queerness but firmly fixed to the future, which is diverse sexuality and gender defying courage and pride. Contemporary yet nostalgic typography builds on this juxtaposition. The system embodies freedom and fluidity, both in a literal, visual sense and as a symbolic testament to the evolving LGBTQ25+ community. The Pride Toronto Festival identity has the capacity to evolve as it grows in years to come. It carefully balances nowness and newness with a well-deserved nod to the festival’s historic beginnings.